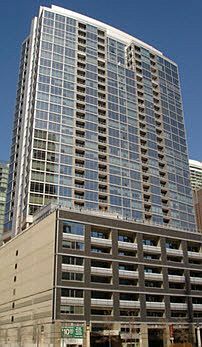 Here are the 240 E Illinois condos for sale and rent with their location, building and apartment information. Schedule a showing online. 240 E Illinois apartments with a condo form of ownership range from 1 bedrooms to 3 bedrooms. One bedroom condos have 874 to 1,314 square feet. Two bedroom condos have 1,291 to 1,798 square feet. Three bedroom condos have 1,595 to 1,918 square feet. Several 1 and 2 bedroom units include a den. All of the condos have floor to ceiling windows, hardwood floors in the main living area, in-unit laundry (typically stacked) and at least one balcony. Cooking appliances are gas. Typical brands include Thermador, KitchenAid, Frigidaire and Bosch. Kitchens range in size from minimal to large with extensive storage and counter space. Even some 1 bedroom units have large kitchens. Units on the 9th floor and a few on the 10th floor have large terraces. 9th floor units also have high ceilings. Most of the condos are in the high rise portion of the building. A smaller number are lofts on the south side of the parking levels. Penthouses are on floors 28 to 31 in the high rise portion of the building. Those penthouses in the center of their floors on the south side of the building have long balconies. 240 E Illinois was built in 2006 and named The Fairbanks & Lofts At Cityfront Plaza. The high rise houses 281 condos within its 31 stories. Pets are ok. The building has its own dog run. The building also has a media room, business room, weight room and cardio room on the 9th floor. There’s a sundeck and outdoor pool. A dry cleaners is on site. Door staff are 24 hour. There are 3 condominium associations at Cityfront Plaza: The Fairbanks, The Lofts and one for the garage. Monthly assessments include air conditioning, cable TV, heat, high speed Internet and water. DKcondo (Draper and Kramer) is the property management company. You can reach the management office at 312-755-0042. The phone number for the front desk is 312-755-0052. The condo association website requires authorization. 240 East Illinois is located 3 blocks west of Chicago’s lakefront. It’s two blocks east of Michigan Avenue. There is a Whole Foods directly below the building. A Walgreens Pharmacy is a block east. The Northwestern Memorial Hospital Campus is just a few blocks away. The building currently has a Walk Score of 95 and a Transit Score of 94. The Red Line stop at Grand and State is 0.6 miles away. Zipcar car sharing is just across the street. The #124 Navy Pier bus has stops right on the corner. Several other bus routes have stops 2 blocks away on Michigan Avenue. The tower has a Bike Score of 82. There’s a Divvy bike sharing station one block away. According to WalkScore.com, 240 E Illinois has a Crime Grade of A. That means it’s a lowest crime area compared to all of Chicago.